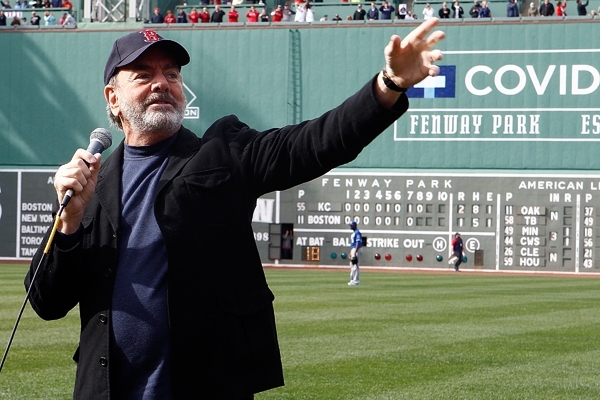 Neil Diamond will be donating royalties from sales of "Sweet Caroline" since the Boston Marathon bombings to a charity that is helping victims of the terrorist incident earlier this month. Diamond's 1969 track, a favorite of the Boston Red Sox, saw a sales boost of almost 600 percent following the April 15th attacks. After seeing the news on Nielsen's Twitter, Diamond retweeted the post and added "Donating these royalties to #OneFund!" "Sweet Caroline" sold 19,000 copies last week, a big jump up from the 2,800 copies it sold the previous week. The track has sold 1.75 million units in total. Though the song, addressed to Caroline Kennedy, doesn't directly mention the Massachusetts capital, it's become a staple of sing-alongs at Red Sox home games for more than a decade. The New York Yankees, Los Angeles Dodgers, Toronto Raptors and other sports teams played "Sweet Caroline" at games following the bombings in a show of solidarity. Diamond also visited Fenway Park last Saturday and led the crowd in singing "Sweet Caroline" at the team's first home game since the attacks. The singer also said he's working on new material partially inspired by the bombings. "I'm writing now and obviously affected by this situation in Boston, so I'm writing about it just to express myself," he told Rolling Stone. "It's like an infestation, and I'm writing about the general situation, not just about this bombing in Boston, but what we're going through with all of these tragedies – shootings and so on and so forth."